Dear Dumb Diary - Book 8 - It's not my fault I know everything. 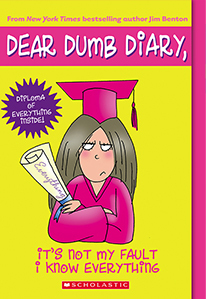 Home > Dear Dumb Diary > Dear Dumb Diary - Book 8 - It's not my fault I know everything. I went back and read some of my very oldest diaries. The entries say things like "I eated salad dressing" and "I got a Barbie shoe stuck in Stinker's nose again" and "The vet was mean to me about the Barbie shoe so I tried to bite him but vets are quick at not getting bit because dogs try all the time but dogs don't usually kick so I did that." What amazed me was just how dumb I used to be, considering how smart I am now. There must have been a day when I just woke up smart.